So, while I'm away enjoying my vacation, I'll leave you with this picture to dwell upon! I promise I will be back on January 13th with a continuation of the Novus Ordo Liturgical Compatibility with the Offertory! 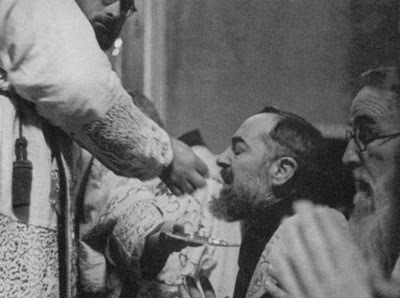 St. Pio of Pietrelcina receiving Our Lord in the Most Holy Eucharist devoutly and lovingly, humbling himself before Almighty God, and opening his mouth as if he were a child in need of his Savior!